Hurricane Maria struck Puerto Rico in September 2017, causing $35 Billion in damages, and leaving most of the homes damaged. Help us to help some of those families get back into their homes, and meet the welcoming, friendly people of Puerto Rico. Volunteers help with many different phases of construction such as mucking & gutting, demolition, drywall, mudding or spackling, priming, painting, flooring, trim, doors and final punch. All training, safety instruction/gear and supervision provided. Costs include lodging in San Juan, most meals, airfare, and ground transportation. Step 1: Registration opens February 10 for members of DreamBuilders congregations (Ascension, Christ Church, St. Mark’s, Temple Isaiah, Trinity) and opens for other volunteers (friends, general public) February 25. Registration for this trip ends March 31. We’ve incorporated several of our past paper forms into an online registration form this year. Please have doctor and insurance information, emergency contact numbers and health information (allergies, medication list, estimated tetanus shot date) on hand before filling out the form. Step 3: Payments: Deposit ($650) for Puerto Rico due within 14 days of registration (if the deposit is not received within 14 days of registration, the registration will be cancelled). Final payment for the Puerto Rico trip is due April 15. 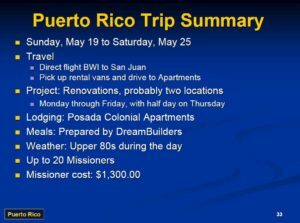 Further information about the Puerto Rico trip to be posted on this page.